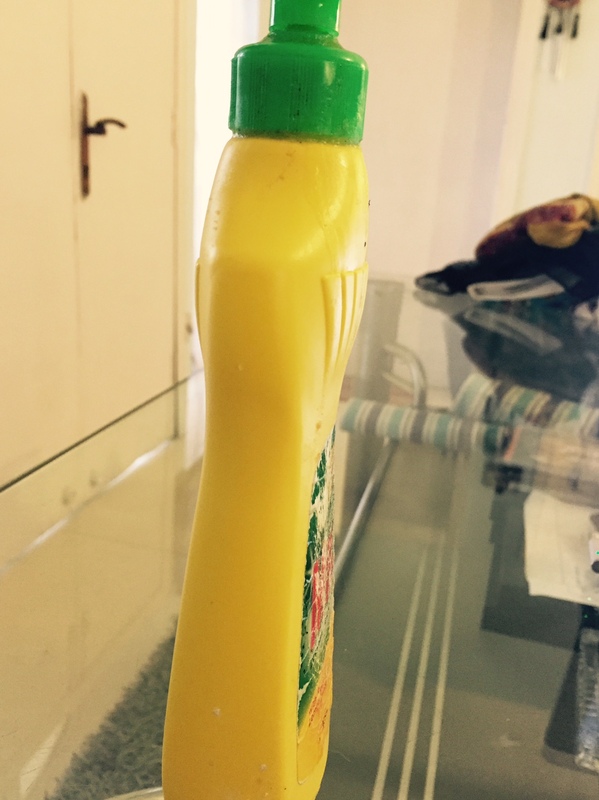 DIY/Simple Hacks – MAASI IS TRYING! Step by step guide on how to make your own cactus garden! I have been meaning to start gardening for as long as I can now remember. God only knows how many Pinterest boards (of course secret!) I have at the moment, that are related to gardening. One day I will, I might, or at least I’ll try (fingers crossed) but for now, let’s do what we can. I came across my sister-in-law’s Instagram pictures the other day and I couldn’t help but ogle at the heaven she has managed to build up on the rooftop of her house. I mean, it’s absolutely magnificent, what she has managed in just under a couple of months! Maasi is Trying talked to Mehreen Hussain to find out how to set up a cactus selection, if we are to do such a thing, with no experience whatsoever. If a cactus garden features heavily in on your future gardening plans, then the following step by step guide by Mehreen Hussain will be more than useful to you guys! MIT: Where does one get the cactus plants from in Lahore? MH: I got the cactus plants from a nursery situated in Model-Town near F-block. These people have one of the largest ranges of cactus plants in Lahore as they import it from Thailand. MIT: How difficult is it to get hold of these things for someone who has no exposure to gardening whatsoever? MH: It will be difficult for someone who has little to no exposure but if you know what you want and want it bad enough, you will be able to do it. Of course, following this guide is a must. MIT: Are there any things that you will need to get from the local market? MH: Yeah definitely, I got pebbles, terracotta pots and marble crush from the local market to make cacti soil. MIT: Okay, so now please tell us all on how to go about it! MH: Well, to start off, get some old terracotta clay pots (anything will do), crush them into fine pieces, add coir and compost (khaad). Now mix to get the cacti soil. Remember, the mixture should be finely crushed. Sand/ fine marble crush (Any close by marble shop will guide you from where you can get marble crush). Mix these ingredients up to get some beautiful cacti soil. Material will look something like this after mixing. You have to now get a glass pot and arrange layers of colourful marble, activated charcoal and cacti soil. At the bottom of the glass jar, spread a layer of some colourful marble crush (gravel), it will make your jar look aesthetically strong. But make sure you don’t over do it. Some people like topping it with activated charcoal as well. Both of these things are purely for decoration purposes. You can avoid both if you’re using a terracota pot. Top layer should be of the cacti soil we made eaelier. When you’re done layering, start arranging your cactus plants (that you got earlier from the nursery) in a way that they balance with each other, while using taller plants at the back and then gradually arranging shorter plants accordingly. You can add any small characters it in order to make it look more pleasing . In the end just add fine marble crush or sand to give it a complete look of a cactus garden. MIT: How often should cacti be watered? MH: Cacti famously survive on little water, but if you want them to grow and flower they should actually be watered regularly during the growing season. Watering them thoroughly will help the roots make good contact with the new soil, and eventually will help them grow well. Cactus and succulents are the plant which required very low maintenance. You just need to water them once a week to keep them healthy. But please do make sure you water the roots of plants only to avoid messing up your sand and composition. Okay ladies, so we do hope this little guide helps you in your quest of getting a beautiful cactus garden up and running! 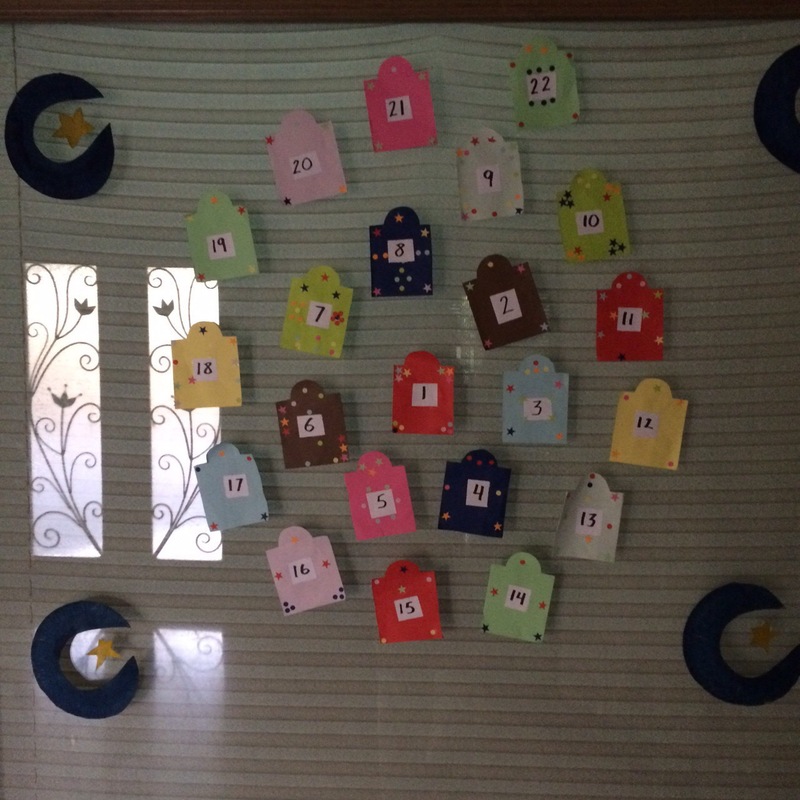 I hope all of you are doing well in this blessed month of Ramadan. Now, yesterday while cooking chicken roast for my kiddies, my face got splattered with hot oil & water. Probably the marinated chicken had a pocket of water which burst when I put it in hot oil. Thank God it was not fatal. This made me think that most of us moms have had been burnt either in the kitchen or by the hot iron once, hopefully not fatally. The important thing is how to treat the burn efficiently & in a manner that it doesn’t leave a scar. I burnt my foot about two years ago when I spilt boiling water on it. At that time I was in so much pain & shock that didn’t remember the first aid details which I had read about so many times. My mum-in-law applied Burnol on the burn & took me to the emergency. The medical staff at the ER peeled off my burnt skin & applied 2 ointments & sent me home. I was still in pain the next couple of days even after using the meds. My husband’s Doctor recommended me to a plastic surgeon who was also a burn specialist. He applied an ointment called Mycitracin and dressed it with gauze & crape bandage. He prescribed me antibiotics and sent me home. After about 2 to 3 hours my pain was gone, seriously I breathed a sigh of relief after suffering for 4 to 5 days. The magic potion here was “Mycitracin”. 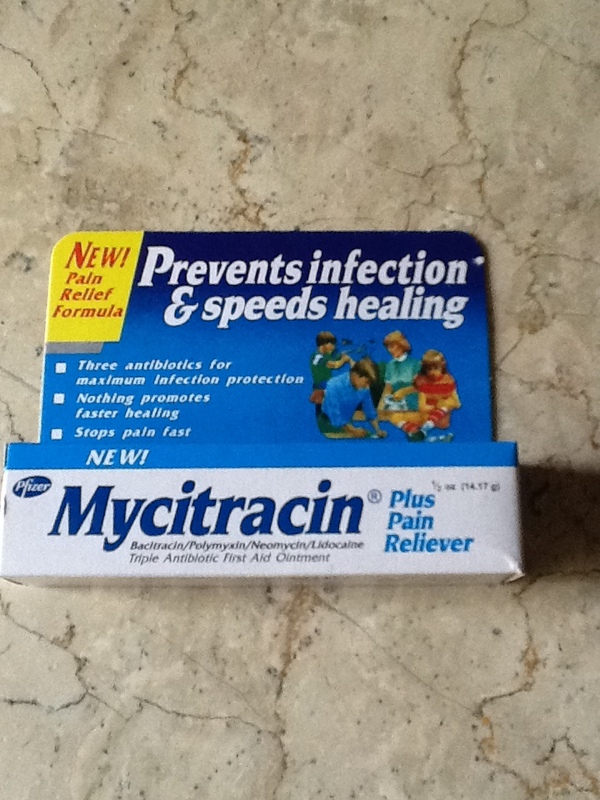 It is a first aid antibiotic ointment with pain reliever, a must have in all homes. It can be used for burns, scrapes, cuts, nicks, scratches and abrasions. I swear by this med, which I have used a couple of times even on my kids. In Pakistan,mostly all homes carry Burnol for treating burns. Burnol may be effective but it does leave a scar and it does not relieve pain, absolutely not. So all you moms out there who are preparing mouthwatering Iftari for your family please be careful & have experienced personnel do the frying. Please do keep this first aid medicine within reach. Please seek professional help after immediately using first aid. DISCLAIMER: The information and reference guides in this website are intended solely for the general information for the reader. The contents of this web site are not intended to offer personal medical advice, diagnose health problems or for treatment purposes. It is not a substitute for medical care provided by a licensed and qualified health professional. Please consult your health care provider for any advice on medications. I am addicted to Pinterest. My sister kept telling me to try it when I was on bed rest during my last pregnancy. At first I wasn’t interested, but she persisted and said that I would really enjoy it. It’s been over two years and my kids tease me every time they see me using my phone for too long. One of the things that has amazed me is that people are using simple items found in the house to either remove stains, or for personal hygiene. With children, stains just add up. And I must say mothers, using the liquid max soap on stains is my new favorite thing. So far, it has taken out black board marker stains off of new white shirts. And don’t forget our greasy food stains, either from cooking or from eating. The fronts of our shirts are forever dotted. With my trusty old toothbrush in tow, i use some of the liquid soap on the stains and let it sit for while, and then use the brush. Sometimes you can’t see if it worked the first time, because of the soap suds, but when its doubtful, dab a little more and Inshallah!!! the stains will be gone. So far so good, but I am not promising anyone anything. Just something you all can try. And remember, if you put the washed clothes in the dryer, or iron them without realising that the stain hasn’t been removed, well, it will take much longer to remove. Sometimes, those stains won’t go away. Sorry, but nothing so far is fool proof. 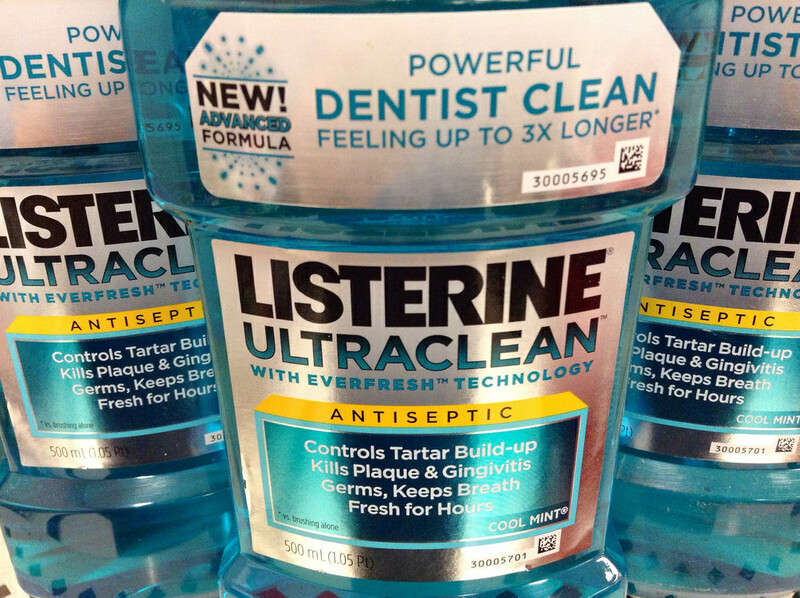 Another thing I learned was the many uses of Listerine mouth wash. It’s not just for your teeth anymore. Two things that intrigued me was that people claimed it removed all the dead skin from the soles of their feet and mothers claimed it helped get rid of lice from their daughters’ hair. I have yet to soak my feet in some warm water and Listerine. Haven’t been able to sit idle for a while to try this particular claim, but will do so soon. But I did try it on my daughter’s hair. Up until last year, we never had this problem. Now, it’s a constant reoccurrence which annoys me! One of the bloggers stated that she and her husband tried Listerine on their blonde daughters’ hair and wrapped it in cling film for more than 1/2 hour. They then combed and washed hair with water to remove the mouth wash. Then proceeded to douse hair with apple cider vinegar and wrapped the hair again for more than 1/2 hour and combed hair again. Afterwards, they washed hair with shampoo and said that the eggs, and nits were all gone. They had pointed out that using the blue Listerine which has mint flavoring was the reason why the nits suffocated and died. They supposedly don’t like the smell of mint. And everyone knows that vinegar is so strong that sometimes it makes people gag just smelling it. (Seems like it has the same affect on lice). So once every few weeks, I put some blue Listerine in a spray bottle (you don’t need much, so the one bottle will stay with you for a long time), and spray my daughter’s hair starting from top of head, to roots, and then to the tips. Make sure you put a towel around her shoulder’s as it makes clothes a bit sticky. Once her hair is completely saturated, i put it up with a clip and wrap her head with cling film. She does her own thing for about an hour, and then I comb her hair and things come out, which i choose not to discuss. By this time, she is not in a good mood, so I can never try step 2 in this procedure. Her hair smells nice and minty, another thing she does not like. But, oh well, at least her hair is clean!! She can deal with the smell! I comb her hair again after she has washed it, and nothing comes out with the comb, I haven’t been able to find the perfect comb that will take the eggs out as well, but that is where our hands and nails come in. LOL! A mother’s job is “ALL HANDS ON!” I do check her hair daily for a few days, then I get lazy. When I get lazy is when they start popping up again. So again, we have to start the entire process. But it works. And all the things needed are usually available at home. So if needed, try it. It might work for you too. Yes, this was an embarrassing thing to talk about, but it happens all the time during school. And I know many of you go through this same problem. There are many other ways of dealing with lice, so please do share any tip. Like my friend Mehnaz said, 2 drops of tea tree oil from Body Shop will also do the trick! Our Mothers Taught Us Wrong! Bless our mothers for putting up with us and teaching us all that they know. My mother is always in my prayers for dealing with the four of us. 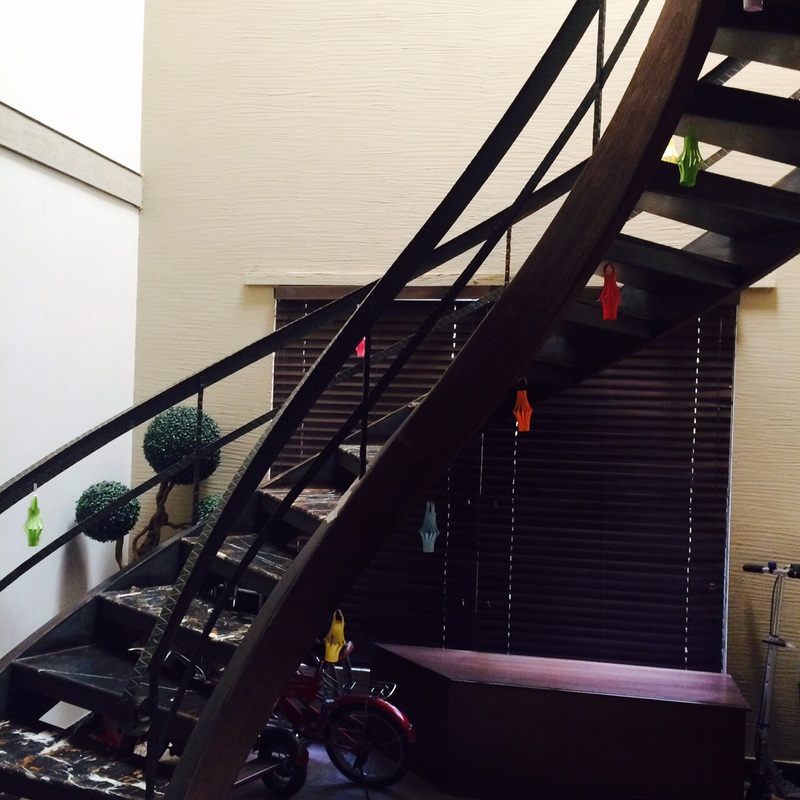 Dealing with our tantrums, our bakwas, our moods, and listening to our stories which usually didn’t make sense. My mom still does that for us. 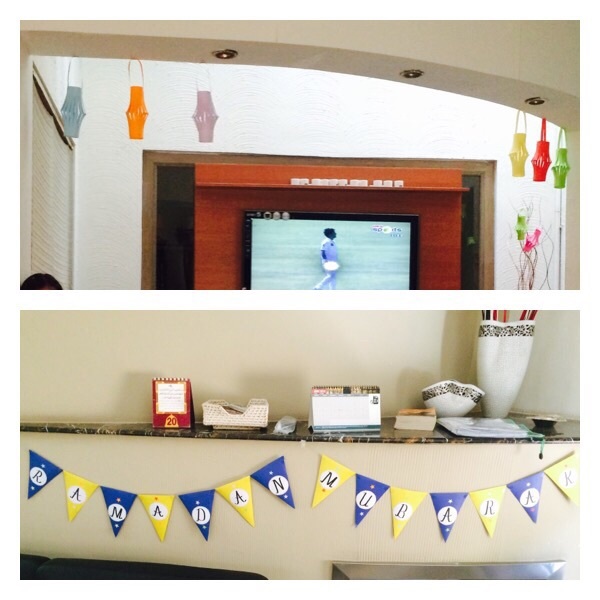 The work of a mother never ends and never gets boring. I’ve learned a lot after marriage as well. How to do laundry, how to fix my clothes that I was a bit careless in wearing and taking off. She has helped me with my cooking, giving me recipes and todkas. Alhumdulillah for my mother who is also living in Pakistan now. I can call her whenever I want and don’t have to worry about the time difference anymore. But we are always having to hang up on each other because someone else needs our attention at that moment, and we usually forget to say/ask what we had actually called for. But, I’m so grateful she is just a few hours away. Love you Momma Cherry! Now back to our mothers teaching us something wrong! It’s truly not their fault because the product is marketed in that fashion. With the wavy side up! So naturally, our mothers wore them that way, and taught us to wear them that way. 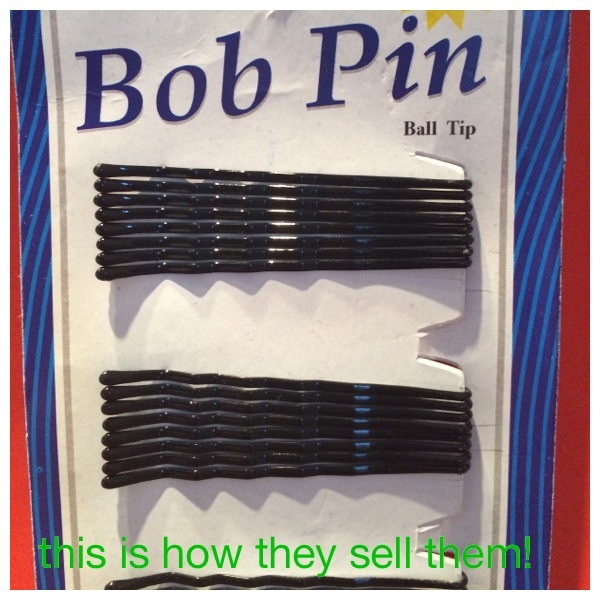 I’m talking about bobby pins ladies!!!! Such a simple product that is always missing when you need them, but help us whip us some major hair styles! 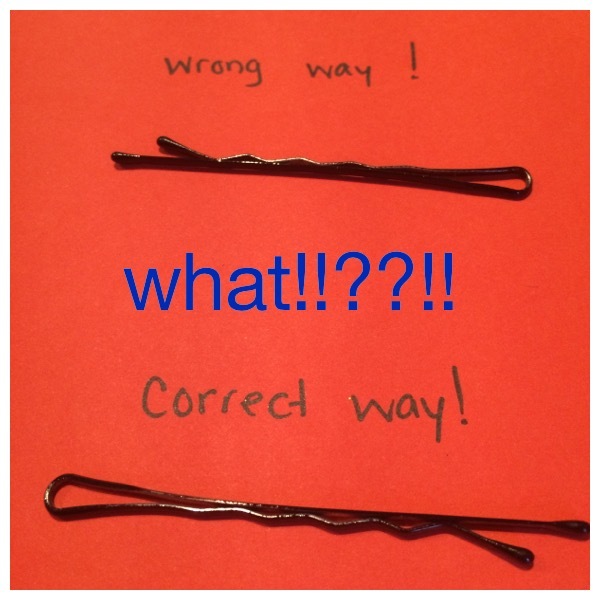 I came across an article that my sister sent stating that bobby pins aren’t supposed to be worn with the waves on top. They won’t stay put that way. Which I already knew since they are always slipping away (and making my hair look untidy by the time I get to my destination). In that article, it also gave some tips on how to wear them properly to get the style you want. I thought it was quite helpful and informative. It was like reading about the hack on how to use a soda can top the right way so that your straw doesn’t fall out. Duh!!! So simple! Yet it never occurred to me that there was another reason for the can tops to look that way! 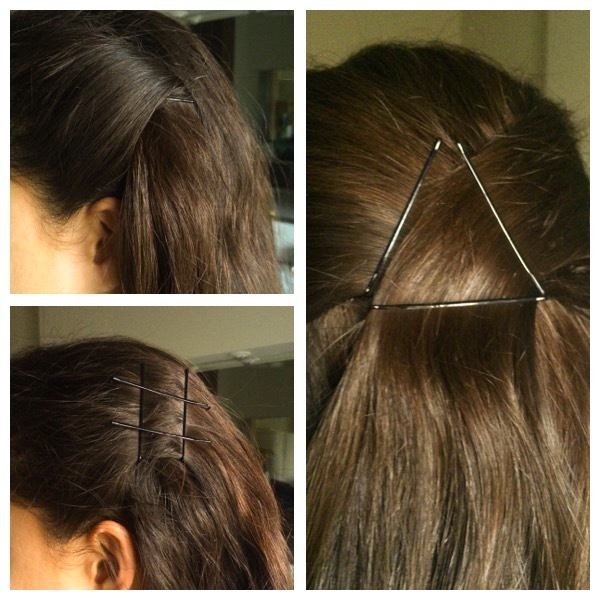 I also learned a few other tips on using bobby pins. Tip #1 was to spray them with hair spray before using them in your hair. This also causes friction and the pins won’t slip down. Tip #2 was another simple idea, and that was to use nail polish to color them. So I did! I bought some cheap Medora nail polish in a nice magneta shade and painted a few bobby pins. They looked nice. I just hope they will help them stay in my hair. (I not only painted the outside but the inside. I thought that it would help them stay on, but since I don’t wear nail polish, I didn’t realize that it’s quite smooth and it might have the wrong affect. So, maybe only the outside needs to be painted. Any feedback is welcomed plz! I tried a few styles on my daughter’s hair and this is how they came out. You might have noticed that I didn’t use the painted bobby pins. The reason is that they didn’t dry in time. I might have put a bit more nail polish than needed in my excitement. You can paint them in different designs and colors and fashion them in amazing ways. Have fun! The Benefits of Owning Clear Nail Polish! Maasi Saba here with Maasi Sabrina, sharing a simple hack with you all. We at times cry over our favorite hijaabs (scarves) being ripped or their threads coming out because of our safety pins. We both have little girls who are in our laps or constantly want to be held, and this can be a problem with our hijaabs (scarves). They get tugged at, and at times move around our head, because of all “our” movements. To find that perfect shade, or print to brighten up your outfit, and sometimes your mood is not easy. Finding scarves that stay put is also not an easy task. So we take great pride in taking care of our scarves, many we have had even before we got married. Maasi Sabrina has found a wonderful and cheap solution to our woes. Thanks my dear. She has also found other uses for this little hack. I guess at the age of 36, its about time i finally bought my first bottle of nail polish. (What would Abu say Sabrina!) So enjoy ladies, and I hope this helps some of you. I’ll let Maasi Sabrina explain it to you now! I’ve been going a bit crazy over all my pretty hijaabs getting ruined lately due to one reason or another. The main culprit?…are my ghetto safety pins. I know, I know, most people use the large pins that are actually meant for hijaabs, but they feel too big for me. I finally found a solution for my problem. 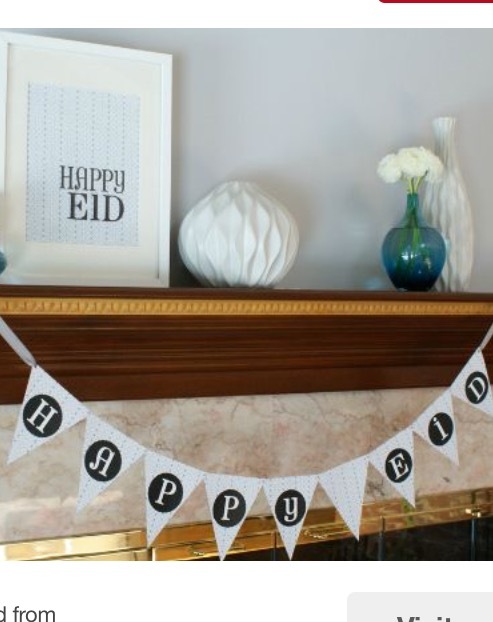 It’s such a simple hack that I can’t believe I didn’t think of it sooner! I blame it on my mommy brain! Lol. So back to my hack! 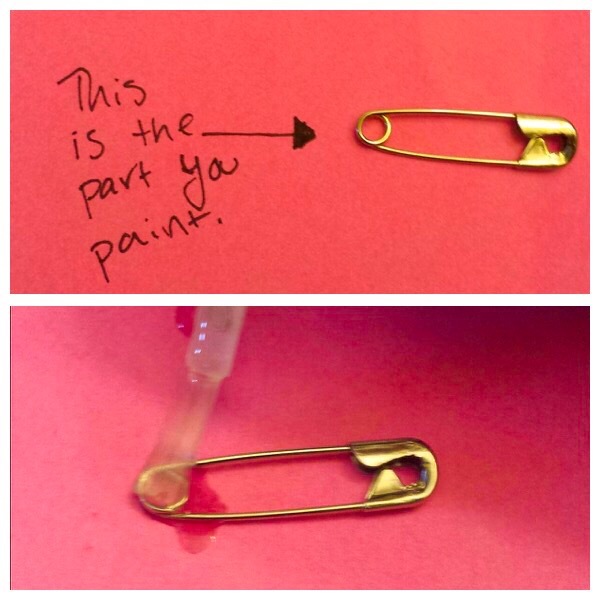 I seal the end of the safety pin towards the back where the circle is formed with clear nail polish! How easy is that. One coat for both sides should do the trick. 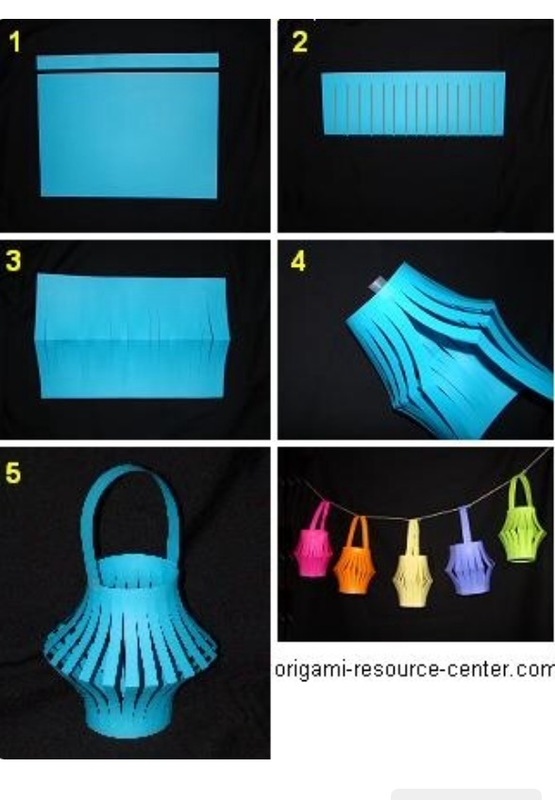 Yes you can use any color you have but there are so many other great hacks for the clear kind. Smudge proof labels – These days everyone is trying to make their own labels; if they are for our spice jars, or our home gardens. Just use one coat and it’ll seal in ur label. No smudges! Threading a needle – It’s so annoying to get thread through a needle, and if you’re a mother, you don’t want to waste time on threading a needle. Keeping a button from falling off – You know how you put on a shirt or jacket and realize your sweet baby has turned your button around and around and now it’s unraveling? If you put a clear coat of the nail polish on the thread it will stop that process. So pretty much you won’t need hack number 2! GENIUS! Seals envelope – I know most people don’t send mail anymore but for those of you in Pakistan who use envelopes for every occasion (our momma! 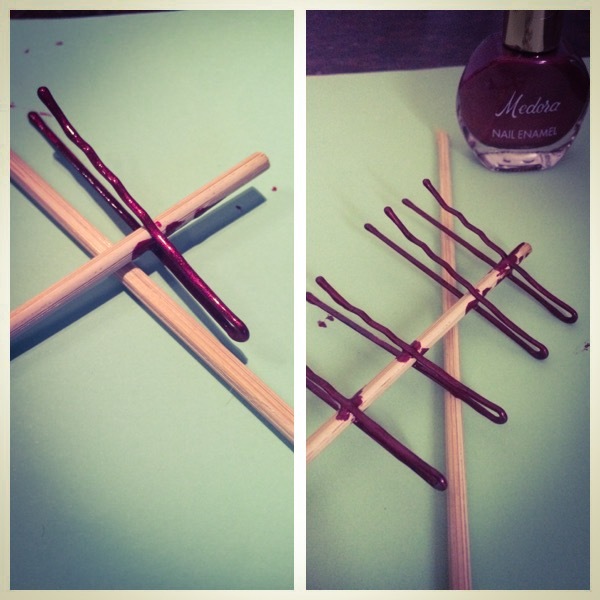 ), use nail polish instead of putting glue. Seals it right up! Prevent costume jewelry from tarnishing – We wear a lot of costume jewelry these days but never realize how quickly they blacken. The clear coat helps it from blackening. And keeps them shining. Stops laces and ropes from unraveling. That one doesn’t need any explanation. 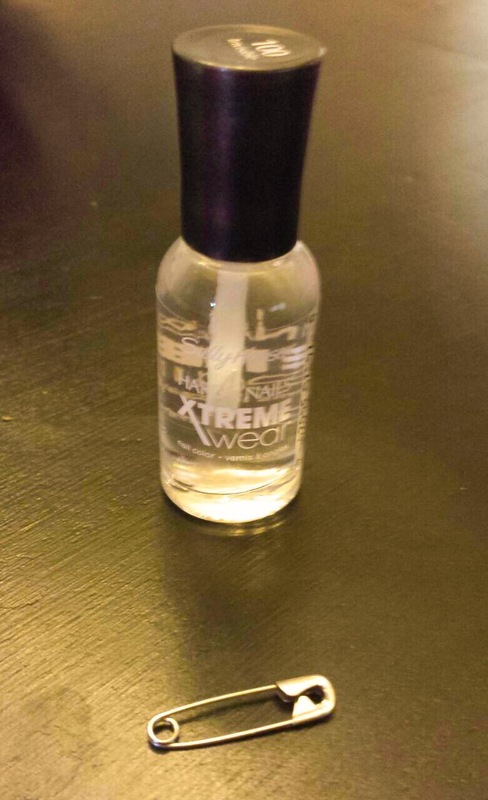 There are actually more things you can use the clear nail polish for, but I notice my post is crazy long already. Hope this helps!